November :: 2015 :: Oracibo.com - Food, Travel, Design and Cooking! On my wish list for our recent trip to Rome was to go to the Colosseum, have a walk about, go for an apertivo somewhere then walk back to the Colosseum to see it lit up at night! But…sometimes things aren’t meant to be! No lights for us! We were later told it’s not being done right now because of the renovations! Damn…but at least on the way back to our apartment we saw some ruins lit up! 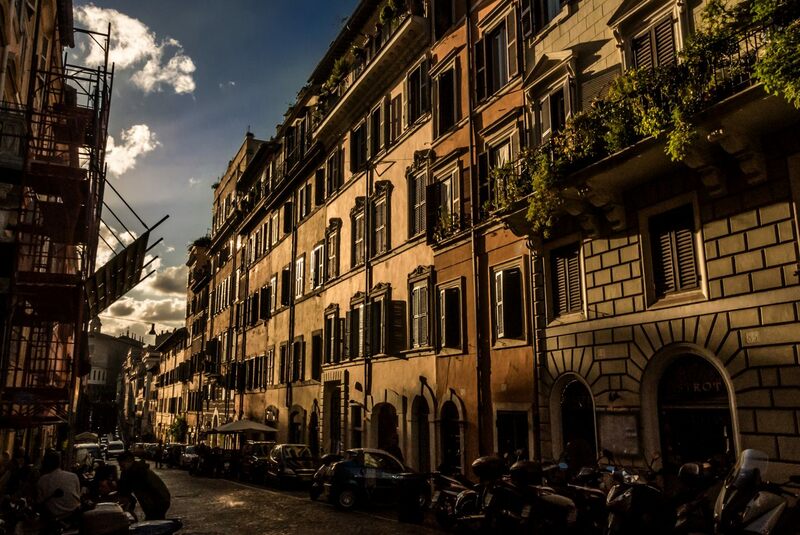 That’s Rome for you…it’s all a bit of a mystery as to what you will or will not find open or operating. Just feel a bit sorry for the people who are on a once in a lifetime trip to Rome and find a lot of stuff under wraps. Winding up the day, we decided on a light dinner. Having seen a recommendation somewhere, we decided to check out Enoteca 313 on via Cavour. Perhaps this is just the place for a few slices of cheese, some ham and a glass of wine? Because we did not enjoy the experience one little bit, except for a great bottle of Vino Nobile from Montelpuciano! The food was OK and we hated the décor! Still scratching our heads about all those wooden beams and posts everywhere (even overhead) and uncomfortable wooden booths…maybe they thought it made it more like an ancient Roman wine bar??? Early one evening after wandering around Piazza Navona and visiting St. Agnese in Agone church, we thought now was the perfect time to have a drink. Cul de Sac, an enoteca nearby, seemed the ideal place! Shortly after we sat down two women sat at the next table and we met Paola and her friend from the U.S.! After spending a couple of hours chatting and before going our separate ways for dinner, we exchanged email addresses. Paola suggested we meet up the following week so she could show us around her neighbourhood of Monti, located between the Piazza Venezia and the Colesseum. During early Roman times the area was occupied by the poor and was full of thieves, pimps and brothels. Things started to change in 1871 when Rome became the capitol of Italy. Nowadays it’s become a very cool, village like neighbourhood with a collection of art galleries, artisans, enoteche. Piazza Madonna dei Monte with it’s fountain, just to the east of the Colesseum, being Monti’s gathering place. We made plans to meet Paola at the fountain one afternoon, but before we met, there was lunch to be had. Where? 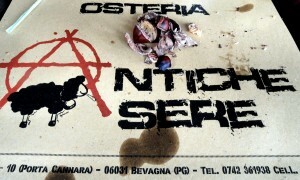 Well…how about La Carbonara 1906 on via Panisperna? OK, let’s! And this time we’ll be there before they close at 2:30! In 2010 we got lost trying to find them and arrived at 2:40…luckily I begged and they agreed to let us have lunch! Only thing we were allowed to order was spaghetti carbonara, salad and wine! This time we could choose whatever our little hearts desired! As soon as I saw that Facebook post, of Elizabeth Minchilli’s, a few months ago, I thought “damned good thing we are going to Rome! She had just picked up her new, awesome Colesseum ring from Arte Orafa Liciardello and then taken a selfie outside, holding up her hand with the Colesseum Via in the background. WOW…I absolutely “need” to check this ring out! We met Paola at the Fontana di Piazza della Madonna dei Monti and then walked up to the 4th century Santa Pudenziana, which is below street level. Then we were onto the 5th century Basilica Papale di Santa Maria Maggiore with it’s absolutely stunning gold and mosaic interior, with Paola providing commentary all the way. We decided we could live in this neighbourhood and it’s no wonder that Elizabeth Minchelli does! Paola invited us to have apertivi at her place. But before we do that, now that the shops have re-opened…I’ve got to see “that ring” and it’s as fabulous as I thought! It’s ordered and I can expect it to arrive in a few weeks! Time for apertivo! With the weather being so nice we sat outside on her lovely terrace sipping wine and petting the cat….ahh, life is good! The ring arrived…it’s amazing…and it makes me smile everytime I look at it! Having just returned from spending 3 weeks in Rome, you’d think I would be writing about the amazing things we saw and did. But not now! Our stay in Rome this trip was made very special by two new friendships made on Facebook. Gareth Jones introduced us to Josephine Wennenholm via Facebook and Wendy Holloway is another of my like-minded FB friends living just outside of Rome. Jo Wennenholm and I had been planning a get-together to celebrate Gareth, who we lost in July and who was planning on meeting up with everyone when we got to Rome. So, a couple of days after we arrived we met up with Jo who had kindly set aside the day in her busy schedule to show us around her area of Rome, the Castelli Romani with its many hilltop towns. We began the day with a tour of an outdoor market, did a drive-by of the Villa Aldobrandini, a stunning example of early Italian Baroque architecture originally constructed in 1550 with it’s gorgeous “Water Theatre” (sadly, the fountains are not working), designed by Orazio Olivieri. Then a walk around and in the 16th century Park Hotel Villa Grazoli, formerly a Cardinal’s residence. It was here that we decided we needed to become millionaires fast so we could retire here in luxury! We made a quick stop in Marino for a “porchetta” tasting at Il Norcino Bernabei…the porchetta was still warm from the oven. We left smacking lips full of porky-herby flavours; simply outstanding porchetta. We get why Gabriele Bonci sells it at his Panificio Bonci on via Trionfale in Prati! 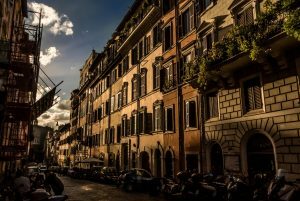 We wound up our tour in Frascati sitting outside, sipping wine at a favourite enoteca of Jo’s, with her husband, who had joined us, watched the sun go down and then headed back to their home for a fantastic dinner with their family. How lovely is that?? We know Gareth would have approved! Jo has a blog “Frascati Cooking-That’s Amore” has a cooking school and is involved in promoting the Castelli among other things! She is the perfect host! 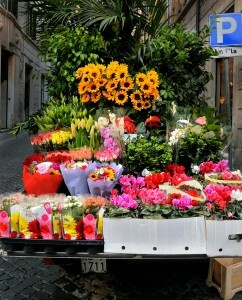 Wendy Holloway of Flavor of Italy had emailed us to make arrangements for a day-trip to Umbria. 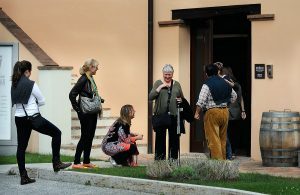 Wendy and Jo organized this excursion, which came about because my Joe wanted to buy some difficult to find Sagrantino wine. The town of Montefalco, a town we visited in 2008, is where you’ll find it and the Arnaldo Caprai Winery is the place for some of the best! 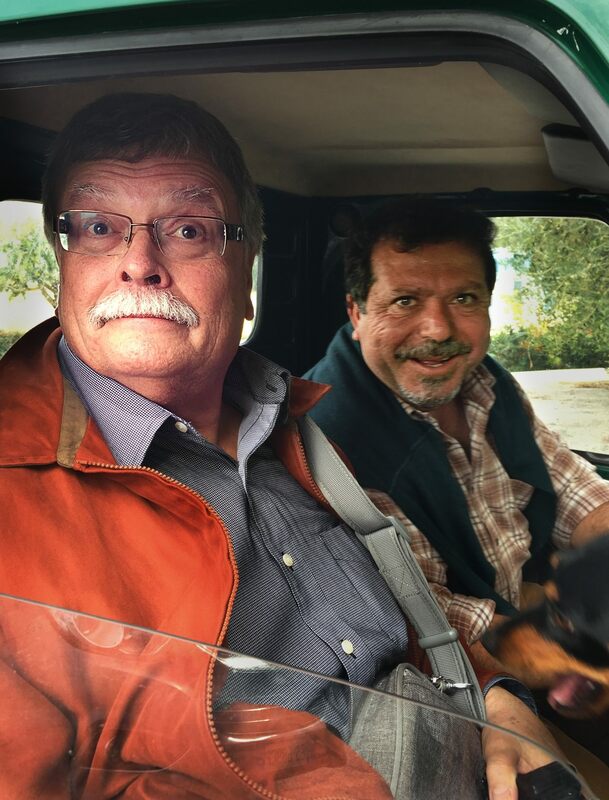 Wendy made arrangements with chef Salvatore Denaro, who’s at the helm of the kitchens at the winery, to meet up with us in Montefalco and from there we piled into our vehicles. Joe insisted on joining Salvatore in his Ape for the short drive to the winery to enjoy apertivi served in the tasting room. It’s time for lunch in Bevagna, a short drive from Montefalco, where Salvatore had made all the arrangements at Osteria Antiche Sere. You know when you see those photos of a group of people sitting outside at a big long table laden with amazing food and bottles of wine and you wish you were there…well we were there! And it just happened to be Porcini/Truffle season! The wine flowed, we ate frittata with truffles, tonnarelli pasta with porcini, huge grilled pieces of fresh porcini and the best crostata ever. We all talked and fumbled along in broken Italian or broken English (thank goodness Jo and Wendy speak both). The weather was perfect… until later in the evening, when on the drive back it really began to rain. But Jo persevered into the dark wet night and got us all back safely to the Montebello train station. We were totally amazed with and how generous and hospitable Jo and Wendy were! Here’s to new friends. Grazie mille for adding that special something to our trip to Rome! And a nod to Facebook for making these connections possible. 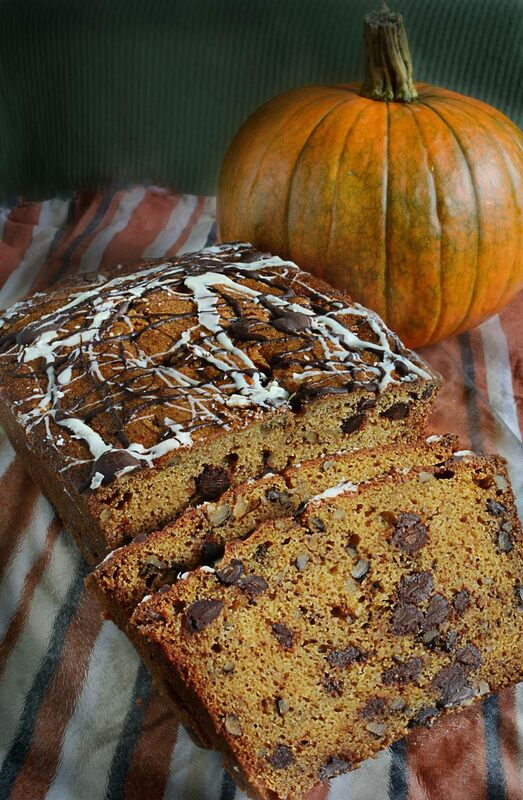 Feel like baking…got pumpkin? Well then…check out the new recipe just up today! Click on the “Recipes” tag and have a look! 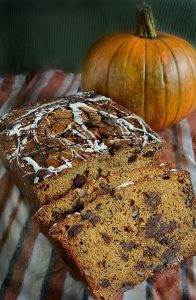 Now I’m off to bake up some pumpkin muffins!